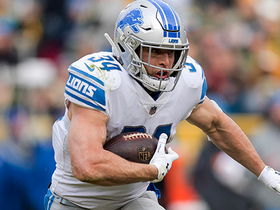 Analysis: Stafford has contended with a back injury in advance of each of the Lions' past three contests, but again it won't stop him from being available, marking his 127th consecutive start. In the previous two outings, he combined for only 309 yards and one touchdown at a clip of 5.9 yards per attempt, numbers that he may replicate versus a Minnesota pass defense that has allowed just 170.8 yards per game, three touchdowns and 6.3 YPA to quarterbacks over the last five games. Stafford (back) was a limited participant in Thursday's practice. Analysis: Stafford's reps were also restricted Wednesday, but coach Matt Patricia hasn't suggested that any shutdown plan is in the works for the star quarterback, who hasn't missed a start since 2010. Even if he advances to full participation in practice Friday to clear up concern about his back injury, Stafford should be viewed as a low-end fantasy option after posting a 5:5 TD:INT over his past seven games while failing to eclipse 300 passing yards in any of those outings. Stafford (back) was listed as a limited participant at Wednesday's practice. Analysis: For the third straight week, the Lions are placing a cap on Stafford's reps due to the back injury. However, his ensuing pair of performances yielded just 309 yards, one touchdown and no interceptions on 52 pass attempts. While there's not much doubt that he'll be available Week 16, a matchup with the Vikings' fourth-ranked pass defense isn't exactly enticing. Stafford (back) completed 22 of 29 passes for 208 yards and a touchdown in Sunday's 14-13 loss to Buffalo. 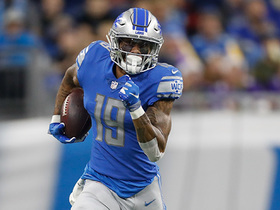 Analysis: Stafford did most of his damage when hooking up with Kenny Golladay, who accounted for 146 of Stafford's 208 yards. The quarterback's lone touchdown was a four-yard score to Andy Jones in the second quarter. With a 3:3 touchdown to interception ratio over the past five games and fewer than 250 passing yards in each of those contests, Stafford shouldn't be on the radar in one-quarterback formats against the Vikings in Week 16. Stafford (back) is active for Sunday's game at Buffalo. Analysis: Despite tending to a back injury, Stafford will be available for the second week in a row. That said, he's facing the Bills' No. 1 pass defense without the services of Kerryon Johnson (knee) and Bruce Ellington (hamstring), so Stafford doesn't exactly have the greatest matchup. Stafford expects to play through a back injury Sunday at Buffalo, Kyle Meinke of MLive.com reports. "I played with it last week, so I plan on playing with it again," Stafford said Friday. Analysis: Limited by the issue for a second consecutive week, Stafford nonetheless is set on suiting up, as intimated by his comment. In his first attempt to do so, he managed just 101 passing yards Week 14 at Arizona, and an upcoming matchup with the top-ranked Bills pass defense isn't exactly inviting, especially with Kerryon Johnson (knee) and Bruce Ellington (hamstring) unavailable. Stafford (back) practiced in a limited fashion Thursday. Analysis: Stafford was tagged as limited on Wednesday's estimated injury report, so maintaining that level of activity in an actual practice signals he'll be fine to play through a back injury for a second consecutive game Sunday against the Bills' top-ranked pass defense. In the first one, he managed a career-worst 101 yards, no touchdowns and zero picks on 15-for-23 passing Week 14 in Arizona. Stafford (back) was a limited practice participant Wednesday, Tim Twentyman of the Lions' official site reports. Analysis: Stafford played through the same injury during Sunday's 17-3 win over the Cardinals, completing 15 of 23 passes for a career-low 101 yards. He should be able to play again this week, but there isn't much cause for optimism in a road matchup with a Buffalo defense that has surrendered just 6.4 yards per pass attempt, the second-best mark in the NFL. Stafford completed 15 of 23 passes for 101 yards during Sunday's 17-3 victory over Arizona. He also rushed once for seven yards. Stafford (back) is listed as active Sunday in Arizona, Kyle Meinke of MLive.com reports. Analysis: Stafford will shrug off the back injury that limited him in practice all week, making his 125th start in a row in the process. Although he can be relied upon to be available from game to game, his current weapons don't give him the best chance to succeed. 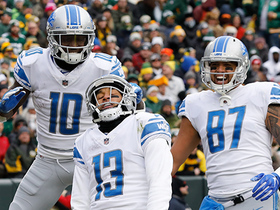 With Golden Tate in Philadelphia, Marvin Jones (knee) on injured reserve and Kerryon Johnson (knee) inactive, Stafford has had modest production the last two contests, totaling 481 yards and one touchdown versus three interceptions. 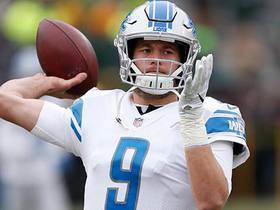 Stafford (back), who is listed as questionable for Sunday's game against the Cardinals, is expected to play, a source tells Ian Rapoport of NFL Network. Stafford (back) is listed as questionable for Sunday's contest in Arizona. 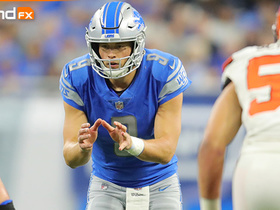 Analysis: Although Stafford was limited in practice all week, he ranks second among active offensive players in consecutive starts with 124, so he has a streak to uphold. Assuming he's active this weekend, he'll be facing a tough Cardinals defense that is fifth against the pass (220.4 yards per game) and has allowed the third-fewest scores (16) to quarterbacks in 12 contests this season. Stafford (back) practiced in a limited capacity Thursday. Analysis: Estimated as a limited participant on Wednesday's injury report, Stafford maintained that level of activity Thursday. 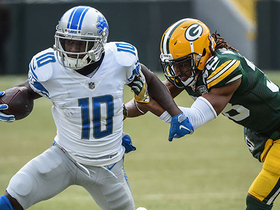 Like wide receiver Kenny Golladay (quadriceps), Stafford doesn't appear to be in danger of missing Sunday's game at Arizona, but his status will continue to be monitored as the weekend draws closer. Stafford was a limited practice participant Wednesday due to a back injury, Dave Birkett of the Detroit Free Press reports. 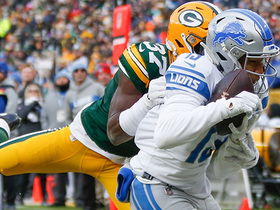 Analysis: With no reports indicating Stafford's back issue is a concern, he should be able to play Sunday in Arizona, flanked by a depleted supporting cast that also includes wideouts Kenny Golladay (quad) and Bruce Ellington (back), who were also limited Wednesday. The Cardinals have allowed just 7.2 yards per pass attempt and 1.4 passing scores per game, typically getting gouged on the ground instead. Stafford completed 20 of 33 passes for 245 yards with one touchdown and one interception in the Lions' 30-16 loss to the Rams on Sunday. He also gained two yards on his sole rush and lost a fumble. Stafford completed 28 of 38 passes for 236 yards with no touchdowns and two interceptions in the Lions' 23-16 loss to the Bears on Thursday. Stafford completed 23 of 37 passes for 220 yards with a touchdown and no interceptions in the Lions' 20-19 win over the Panthers on Sunday. He also gained six yards on three rushes. Stafford completed 25 of 42 passes for 274 yards with two touchdowns and two interceptions in the Lions' 34-22 loss to the Bears on Sunday. He also rushed twice for nine yards and fumbled once but got the recovery. Stafford completed 25 of 36 passes for 199 yards without a touchdown or interception in Sunday's 24-9 loss to the Vikings. He also rushed five times for six yards and lost a fumble. 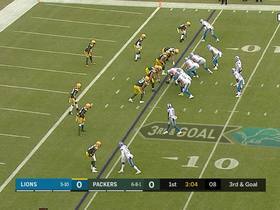 Analysis: Stafford was under siege throughout, taking 10 sacks. His fumble came on a regrettable decision to pitch the ball back to his running back on the outside, leading to a 32-yard Vikings defensive touchdown when the play went awry. If Stafford doesn't get better protection in Week 10 against the ferocious Bears defense, he could be in for another ugly afternoon. Listen as Detroit Lions quarterback Matthew Stafford is mic'd up against the Cleveland Browns in Week 10 of the 2017 NFL season. 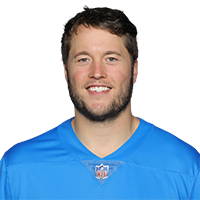 NFL Network's Ian Rapoport reports that Detroit Lions general manager Bob Quinn confirms the return of Matthew Stafford as their quarterback. 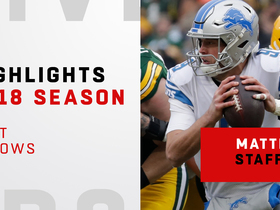 Watch Detroit Lions quarterback Matthew Stafford's best throws of the 2018 season. Detroit Lions wide receiver Kenny Golladay makes a 9-yard sideline catch from quarterback Matthew Stafford. 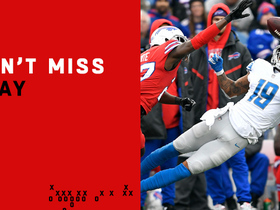 Detroit Lions wide receiver Kenny Golladay pulls in impressive 31-yard catch.